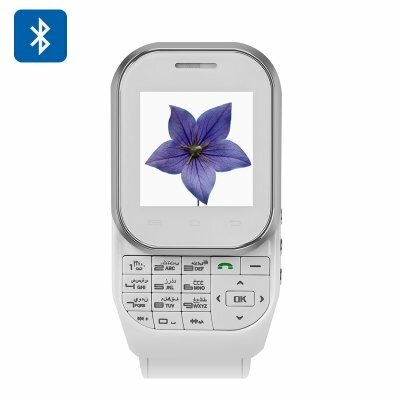 Successfully Added KenXinDa W1 Smart Watch Phone - Slideout Keyboard, 1.44 Inch LCD Capacitive Screen, GSM900/1800, Dual SIM, Camera (White) to your Shopping Cart. This functional watch phone has a unique design that makes the KenXinDa Stand out from the crowd and is sure to turn some heads. Tha majority of watch phones have a screen that is used for interacting and dialing numbers as well as displaying all the relevant information, This can be hard to see and tricky to use. However, Ken Xin Da have solved this by offering a slid out keypad so you can clearly see the screen when dialing numbers or typing a message. This smart watch approach bring great userability making the W1 a jot to use. The 1.44 LCD capacitive touch screen is still as responsive as you would expect from a top end smart watch and can be used to switch between menus and navigate though options with the home, menu and return buttons at the bottom of the screen. The KenXinDa W1 is one of the few smart watches with not one but two SIM card slots, each of which can support GSM 900 or DCS1800 frequencies so you have the choice of monitoring two numbers at once. Pack full of features, the KenXinDa W1 will let you send and receive messages, plan you day, enjoy media playback and even snap pictures and video of your own with the built in camera A micro SD card slot offer support for up to 16GB of storage and this should be plenty of space for several hours worth of music or video entertainment. Having a 300 mAh battery will provide you with 2 hours of usage time or as much as 50 hours in standby. The KenXinDa W1 Bluetooth Watch Phone comes with 12 months warranty. Brought to you by the leader in electronic devices as well as wholesale Bluetooth watch phones, Chinavasion..